A fiery plane crash at the Aspen airport Sunday afternoon killed one person and injured two others, one severely, Colorado authorities said. Officials said the flight originated in Mexico and all three aboard were Mexican men. Alex Burchetta, director of operations for the Pitkin County Sheriff's Office, identified the man who died as Sergio Carranza Brabata of Mexico. He did not release the names of the two injured, and he did not know where in Mexico Brabata lived. Burchetta said the plane went off the right side of the runway, flipped over and burst into flames. "The injuries were traumatic in nature, but they were not thermal," he said. "So the fire never reached inside the cabin as far as we can tell." Ginny Dyche, a spokeswoman for Aspen Valley Hospital, said the facility received two patients who were involved in the crash. She later said one patient in fair condition and another in critical condition were transferred elsewhere. Peter Knudson, a spokesman for the National Transportation Safety Board, confirmed the plane was a Canadair CL-600, a midsized private jet. The aircraft is registered to the Bank of Utah in Salt Lake City, according to Federal Aviation Administration records. Bank officials did not immediately respond to phone and email messages seeking comment. Allen Kenitzer, an FAA spokesman, said the plane was headed from Tucson, Ariz., and crashed upon landing. Officials said the crash happened at 12:22 p.m. MT. A plane with the same tail number took off at 6 a.m. MT from the airport in Toluca, a city about 56 kilometres west of Mexico City, before stopping in Tucson, according to a Mexican federal official who spoke on condition of anonymity because he was not authorized to speak to the press. The official said the passengers aboard were three Mexican men: the pilot, co-pilot and a passenger. He declined to release their names, citing security reasons. Tucson International Airport officials didn't immediately have more information. Attempts by The Associated Press to reach airport officials in Colorado were not immediately successful. The crash prompted Twitter responses from two celebrity witnesses, who confirmed to The Associated Press that they sent the tweets. Country singer LeAnn Rimes Cibrian tweeted via @leannrimes on Sunday: "So sad! 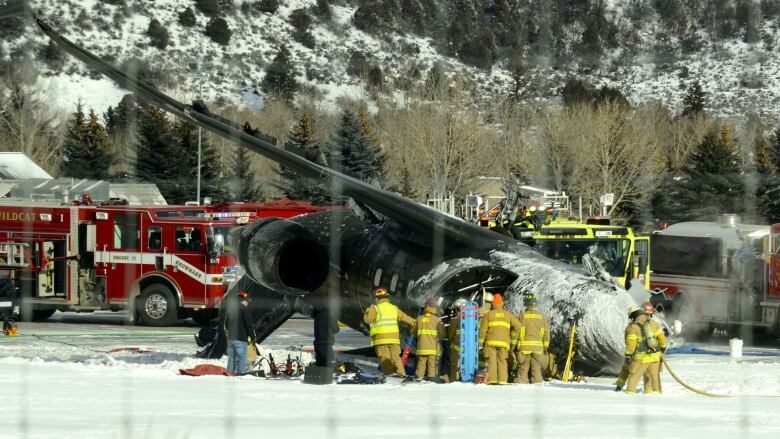 Horrible plane crash we just saw happen at the Aspen airport." Comedian Kevin Nealon sent a series of tweets about the crash through @kevin—nealon. His first one said, "Horrible plane crash here at Aspen airport. Exploded into flames as it was landing. I think it was a private jet." Later he tweeted, "Airport is closed now. I think I'll drive back to LA after seeing that." Tom Renwick, a National Weather Service meteorologist in Grand Junction, said snow showers were reported in the area Sunday afternoon, but not at the airport. He said it has been overcast all day with temperatures hovering around -12 C.
Aspen is located in the Rocky Mountains about 160 kilometres southwest of Denver by air. An earlier version of the story said Aspen is about 300 kilometres southwest of Denver. In fact, Aspen is about 300 kilometres southwest of Denver by ground transportation and about 160 kilometres away by air.